Mrs. Adams cared for her children at their Braintree home while her husband was an accomplished lawyer. With the American Revolution, she was left largely alone for ten years to run their household. She joined her diplomat husband in Europe in 1784 where they spent eight months in Paris and three years in London. They returned to the United States in 1788 where John Adams served as vice president and president. Abigail spent equal time in the capital and at her family home. One of America’s first poets; Bradstreet’s poetry was noted for its important historic content until the mid-1800s publication of Contemplations, a book of religious poems. She was the founder of the Oblate Sisters of Providence. She was the first black Roman Catholic order in the U.S. She promoted education for deprived people. Elizabeth Blackwell was the first woman to attend medical school and practice medicine in the United States. She desired to provide a more comforting experience for women and children. 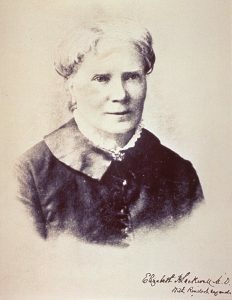 Elizabeth Blackwell organized the Women’s Central Association of Relief during the Civil War. She trained nurses for war service. Elizabeth, along with Emily, and Mary Livermore, played important parts in developing the United States Sanitary Commission. Shortly following the war, the sisters established the Women’s Medical College in New York. Blackwell served as the professor of hygiene until 1869, when she moved to London to help from the National Health Society and the London School of Medicine for Women. Mary Fields lived by her wits and her strength. She traveled north to Ohio, settled in Toledo and worked for the Catholic convent. She formed a strong bond with Mother Amadeus. When the nuns moved to Montana and Mary learned of Mother Amadeus’ failing health, she went west to help out. Having nursed Mother Amadeus back to health, she decided to stay and help build the St. Peter’s mission school. She protected the nuns. Mary was a pistol-packing, hard-drinking woman, who needed nobody to fight her battles for her. When turned away from the mission because of her behavior, the nuns financed her in her own business. She opened a cafe. Mary’s big heart drove her business into the ground several times because she would feed the hungry. In 1895 she found a job that suited her, as a U.S. mail coach driver for the Cascade County region of central Montana. She and her mule Moses never missed a day, and it was in this capacity that she earned her nickname of “Stagecoach”, for her unfailing reliability.